gDepartment of Radiology (A.D.V. ), University Hospital La Timone, Marseille, France. SUMMARY: Neurovascular compression syndromes are usually caused by arteries that directly contact the cisternal portion of a cranial nerve. Not all cases of neurovascular contact are clinically symptomatic. The transition zone between the central and peripheral myelin is the most vulnerable region for symptomatic neurovascular compression syndromes. Trigeminal neuralgia (cranial nerve V) has an incidence of 4–20/100,000, a transition zone of 4 mm, with symptomatic neurovascular compression typically proximal. Hemifacial spasm (cranial nerve VII) has an incidence of 1/100,000, a transition zone of 2.5 mm, with symptomatic neurovascular compression typically proximal. Vestibular paroxysmia (cranial nerve VIII) has an unknown incidence, a transition zone of 11 mm, with symptomatic neurovascular compression typically at the internal auditory canal. Glossopharyngeal neuralgia (cranial nerve IX) has an incidence of 0.5/100,000, a transition zone of 1.5 mm, with symptomatic neurovascular compression typically proximal. The transition zone overlaps the root entry zone close to the brain stem in cranial nerves V, VII, and IX, yet it is more distal and does not overlap the root entry zone in cranial nerve VIII. Although symptomatic neurovascular compression syndromes may also occur if the neurovascular contact is outside the transition zone, symptomatic neurovascular compression syndromes are more common if the neurovascular contact occurs at the transition zone or central myelin section, in particular when associated with nerve displacement and atrophy. Neurovascular compression syndrome (NVCS) is defined as a direct contact with mechanical irritation of cranial nerves (CNs) by blood vessels.1⇓⇓⇓–5 The most common neurovascular compression syndromes are trigeminal neuralgia (TN; compression of CN V), hemifacial spasm (HFS; CN VII), vestibulocochlear neuralgia (CN VIII), and glossopharyngeal neuralgia (GN; CN IX). Because neurovascular contacts are frequent imaging findings in asymptomatic patients, several factors will determine whether a neurovascular contact may become symptomatic. First, arteries are more likely to cause symptomatic NVCS than veins, presumably due to the higher pressure and pulsatility.5,6 Second, the anatomic location of the neurovascular contact can also be a relevant factor. Cranial nerves are surrounded by a myelin sheath, which provides insulating and metabolic support for the axon. Oligodendrocytes form the myelin in the central nervous system, whereas Schwann cells form the myelin in the peripheral nervous system. The transition zone (TZ) between central and peripheral myelin7 is an anatomic area with increased mechanical vulnerability, which is of particular interest in the context of symptomatic NVCS.8 Skinner9 already demonstrated in 1931 that the length and location of the TZ varies between cranial nerves, with CN VIII having a long and distal TZ in comparison with CNs V, VII, and IX. The term “root entry/exit zone” (REZ) is often used in the context of NVCS.10 In some publications, the term “REZ” is used as a synonym for TZ, whereas in other publications, the term “REZ” is used to define the portion of the nerve that includes the TZ, the central myelin root portion, and the adjacent brain stem surface11; the 2 terms should, therefore, not be used interchangeably.8 The TZ appears to be the more relevant and vulnerable anatomic structure, and it is not always located in the same position as the REZ. For example, in the vestibulocochlear nerve (CN VIII), the TZ is clearly distal to the REZ. In the current article, we, therefore, focus on the TZ. Exact anatomic knowledge of the position and morphology of the TZ is of fundamental importance for the interpretation of neuroimaging findings in suspected NVCS (Fig 1). This review highlights current evidence regarding the TZ and implications for imaging. We also provide illustrative cases of normal anatomy and histologic sections from postmortem specimens for the understanding of the etiology of NVCS, as well as surgically proven cases of NVCS involving CNs V, VII, VIII, and IX. 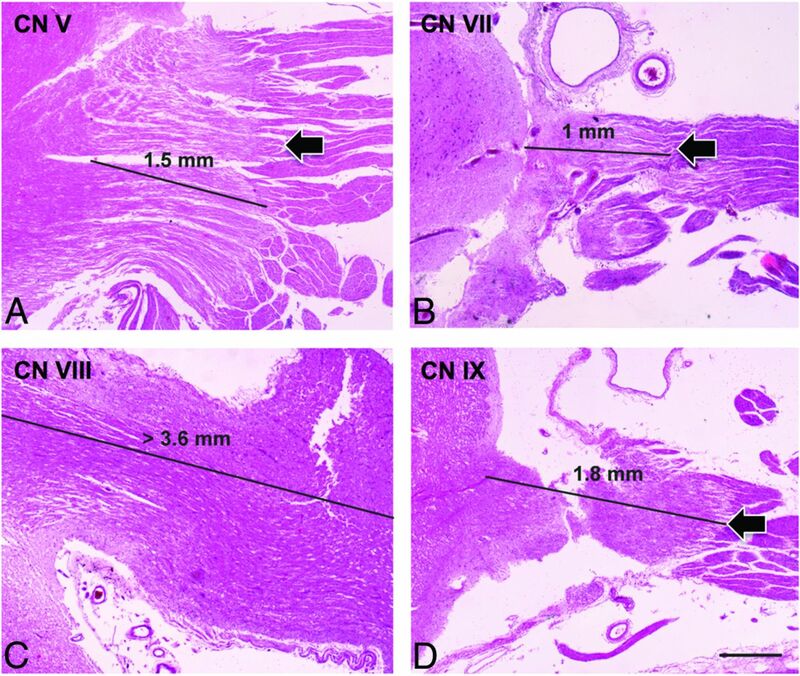 Histologic images of the transition zone of the trigeminal (CN V, A), facial (CN VII, B), vestibulocochlear (CN VIII, C), and glossopharyngeal (CN IX, D) nerves. Note the very distal TZ of CN VIII, which is beyond the field that can be analyzed with the current methodology compared with CNs V, VII, and IX (hematoxylin-eosin, scale bar on D = 0.5 mm). Normal anatomy of the cisternal segment of CN V obtained at 3T. Axial 0.6-mm thin-section (A), coronal (B), and sagittal (C) 2D reconstructions (same thickness) from a 3D T2-weighted balanced steady-state free precession sequence. Note that multiple individual nerve fibers can be identified in both cisternal CN Vs. The short arrow in C points to the motor root of the left CN V, while the long arrow points to the sensory root. NVCS in a 55-year-old woman with right TN. Fusion of CISS (0.6-mm sections) and TOF angiography sequences (A, axial; C, coronal; E, sagittal) show contact between the duplicated superior cerebellar artery and the superior portion of the cisternal CN V (arrows). Tractography reconstruction from DTI (B, superior view; D, right CN V; F, left CN V) shows a slightly diminished number of fibers on the right, as opposed to the left. Fiber color-coding is the following: anteroposterior = green; left-right = red; craniocaudal = blue. Fractional anisotropy measurements show diminished values on the right. Right TN in a 45-year-old man caused by venous compression. Axial (A) and coronal (C) 2D reconstruction from CISS (0.7-mm thin sections). Contrast-enhanced 3D T1-weighted reconstructed images (0.9 mm) in the axial (B) and coronal (D) planes. Intraoperative views before (E) and after (F) the operation. MR imaging shows bifocal CN V (white arrows) compression by the Dandy vein (white short arrows) and by a transverse pontine vein (black arrows), respectively. Teflon (Dupont, Wilmington, Delaware) (asterisk, F) was interposed between CN V (white arrow, F) and the Dandy vein (white arrowhead, F). The transverse pontine vein was coagulated (black arrow, F). Intraoperative images are courtesy of Dr Arnaud Deveze, MD, Department of Ear, Nose and Throat Surgery, University Hospital, Hôpital Nord, Marseille, France. NVCS in a 70-year-old man with left TN. Axial T2-weighted image (A, 0.5 mm). Contrast-enhanced T1-weighted image (B, 0.5 mm). Fusion of 3D T2 and TOF angiography sequences (C and D, sagittal; E and F, coronal sections). Note contact between the tortuous vertebral arteries (white arrowheads), the left AICA (black arrows), the superior cerebellar artery (white arrows), and the cisternal left CN V (black arrowheads). Note that the TZ of CN V is thinned, while the more distal portion of CN V close to the Meckel cave has a normal rounded shape. Gray arrowhead points to the right CN V.
In most patients with classic TN, surgical decompression of the CN V root produces immediate intraoperative improvement in nerve conduction and rapid symptom relief (Fig 4). This phenomenon is thought to reflect the reversal of a compression-induced conduction block in larger myelinated fibers outside the region of demyelination.23 Immediate postoperative pain relief is between 87% and 98%. Approximately 80% of patients with microvascular decompression are symptom-free 1 year after the procedure; however, 8–10 years later, this percentage decreases to 58%–68%.33,34 Immediate postoperative remission is an independent predictive factor for good long-term outcome after microvascular decompression.34 Before considering microvascular decompression, patients usually undergo pharmacologic treatment with carbamazepine, oxcarbazepine, or, in selected cases, baclofen, gabapentin, and other anticonvulsants. Further treatment options in TN include stereotactic radiosurgery (also called “gamma knife”), which is increasingly performed, especially in elderly patients. 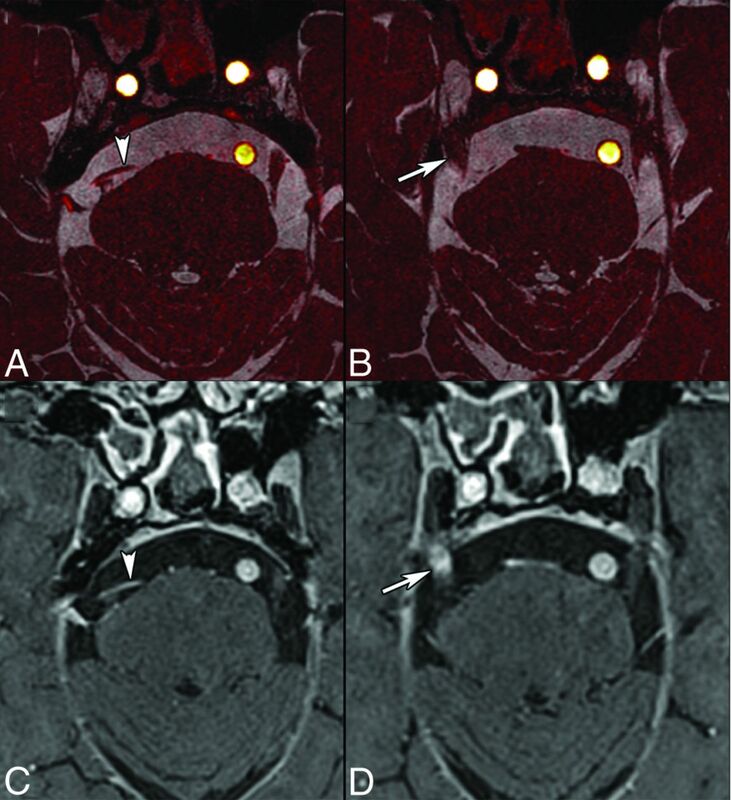 Atrophy of CN V in patients with classic TN has been observed intraoperatively and at MR imaging (Fig 4).29,38⇓⇓–41 Erbay et al39 found that the nerve diameter and cross-sectional area were 20% and 28% smaller on the symptomatic side compared with the asymptomatic side. 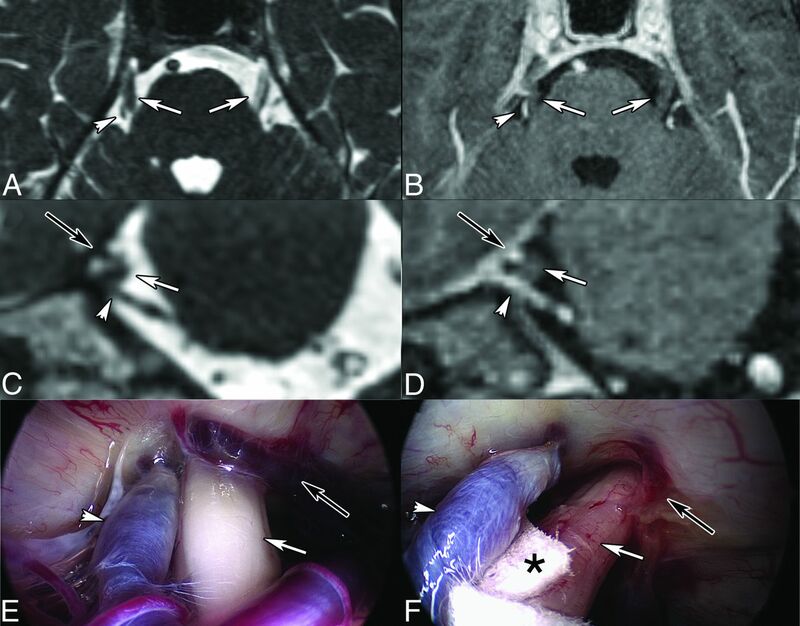 Horínek et al40 found that the volume of the affected nerve was, on average, 28% smaller than that of the unaffected nerve; however, only 7 of the 18 patients with TN were diagnosed with nerve atrophy on the basis of MR imaging volumetry. Although CN V atrophy can be observed in TN, the low sensitivity of this finding does not warrant its routine use for the diagnosis of trigeminal NVCS. Nevertheless, according to Antonini et al, in 2014,36 nerve atrophy and displacement are highly specific (97%) signs with good negative (82%–87%) and positive (81%–86%) predictive values. In summary, anatomic abnormalities such as deformity and atrophy of the cisternal CN V and a small cerebellopontine angle cistern are more frequent in symptomatic NVCS and—whenever present—should be used as additional diagnostic signs. MR imaging can also be used to assess padding or other morphologic and functional changes after microvascular decompression45 or stereotactic radiosurgery (gamma knife) for TN. After stereotactic radiosurgery, the affected nerve may show focal contrast enhancement (Fig 6), and gradual decrease of nerve volume occurs with time. Park et al29 found CN V atrophy of the affected side in 96% of patients with TN treated by stereotactic radiosurgery, with a mean reduction in CN V volume of 39%. TN in an 81-year-old man treated with stereotactic radiosurgery. 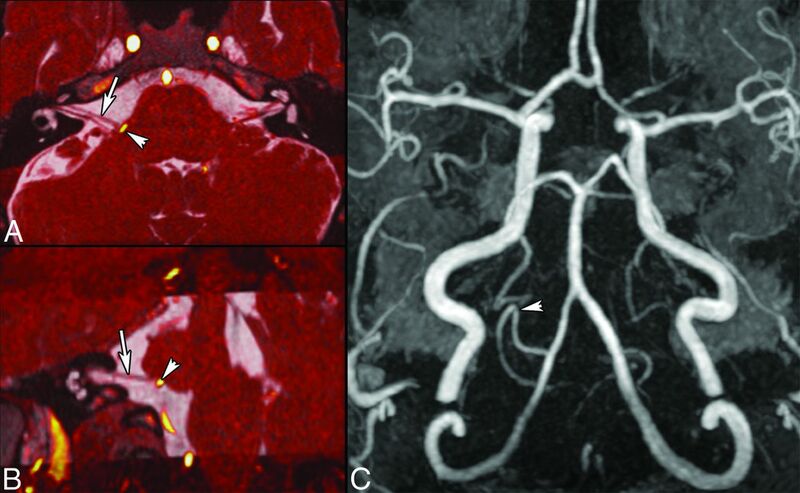 Axial images (0.5 mm) obtained by fusion of CISS and TOF angiography sequences (A and B) and contrast-enhanced 3D T1-weighted volumetric interpolated brain examination (C and D, 0.6 mm) show NVCS caused by the superior cerebellar artery (arrowheads). 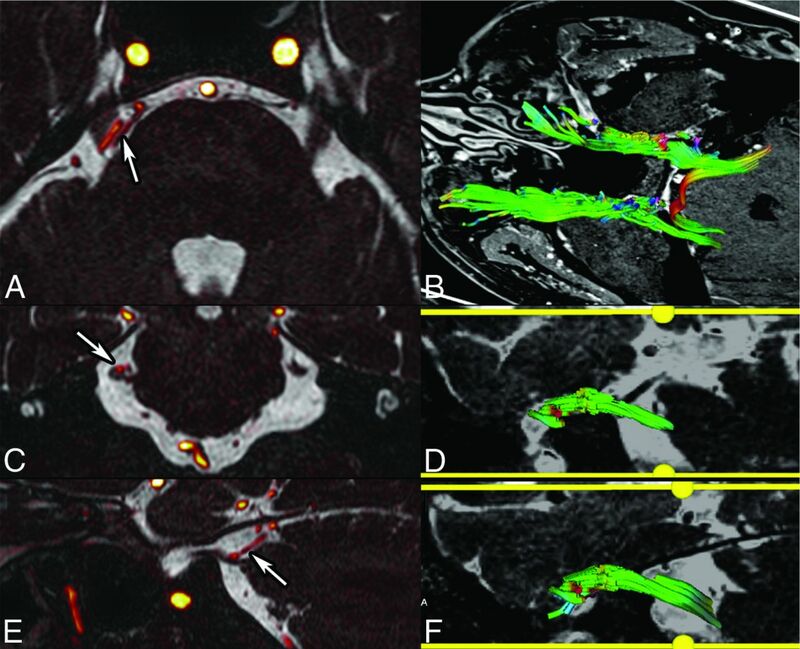 There is contrast enhancement of the right CN V at the stereotactic radiosurgery site (arrow, D). Contrast enhancement on follow-up examinations disappeared gradually. Hemifacial spasm is characterized by unilateral, intermittent contractions of the muscles of facial expression, typically beginning in the orbicularis oculi and spreading to the other muscles.48 Primary HFS is triggered by NVC, whereas secondary HFS comprises all other causes of CN VII damage. HFS has an incidence of 0.77/10,000.49 The AICA (43%) is the most common vessel causing NVC (Figs 7 and 8), followed by the posterior inferior cerebellar artery (31%) and vertebral artery (23%).6 NVCS can occur either at the REZ (10%–96% depending on study),50,51 adjacent cisternal segment (up to 64%),6 TZ (22%), or other cisternal portions (3%).6 According to Dou et al,52 attrition of the neurovascular interface yields action potentials from the demyelinated facial nerves and therefore causes HFS symptoms. As shown by Sindou et al,51 microvascular decompression is highly effective in HFS and symptoms disappear after an operation in 90%–95% of cases; however, recurrence is seen in up to 25% of patients. In the long term, 75%–85% of patients remain symptom-free. HFS caused by a posterior inferior cerebellar artery (PICA) loop in a 54-year-old man. 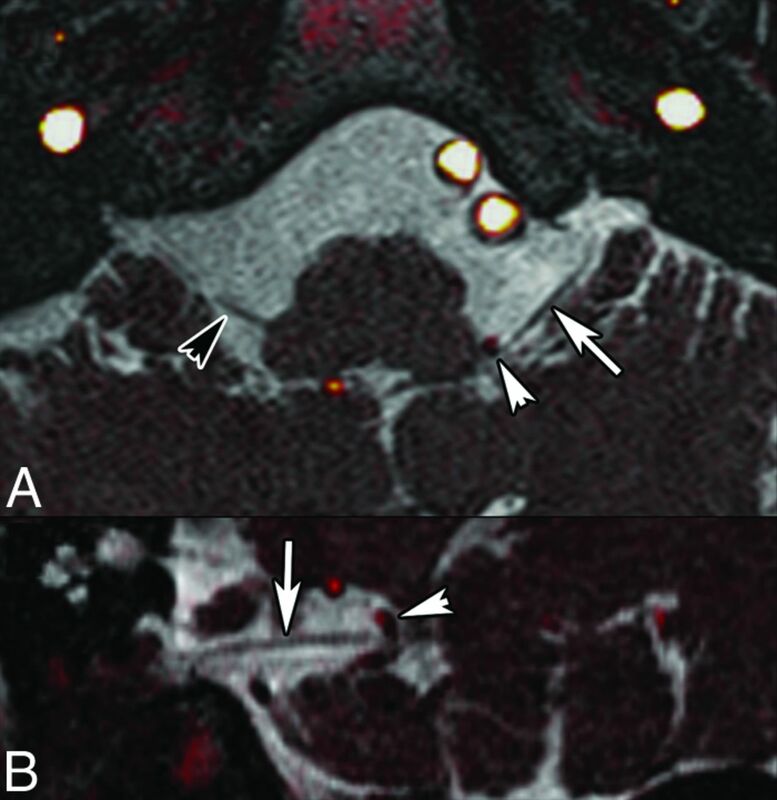 Axial oblique (A) and coronal oblique (B) reformatted images obtained by fusion of CISS (0.6 mm) and TOF angiography sequences show NVC of CN VII (arrows, A and B) by the PICA at the presumed TZ (arrowhead). 3D MIP reconstruction of the TOF sequence (C) shows a PICA loop on the right, responsible for HFS. Findings were confirmed surgically. Right HFS caused by an AICA loop in a 60-year-old man. Fusion of 3D T2 and TOF angiography sequences (0.6-mm thin sections; A, axial; B and C, coronal sections). Axial oblique reformatted T2-weighted image along the cisternal CN VII (D). Coronal oblique reformatted contrast-enhanced T1-weighted image (E). Note contact between an AICA loop and the presumed TZ of CN VII (white arrows), which is slightly indented. There is a second contact between the AICA and the more distal CN VII (arrowheads). Black arrows point to CN VII. NVCS due to the AICA loop impinging on the TZ was confirmed surgically. After the operation, symptoms disappeared. NVC of CN VIII (Vestibular Paroxysmia). NVC in a 70-year-old man with tinnitus and vertigo. A, Axial oblique reformatted T2-weighted image (0.5 mm). Coronal oblique T2-weighted images (0.5 mm; B, anterior section; C, posterior section). Note the tortuous AICA (arrows) displacing and indenting the cochlear nerve (B) and the vestibular nerve (C). Brain and temporal bone MR imaging and high-resolution temporal bone CT findings were otherwise normal. GN caused by a tortuous vertebral artery in a 64-year-old man. 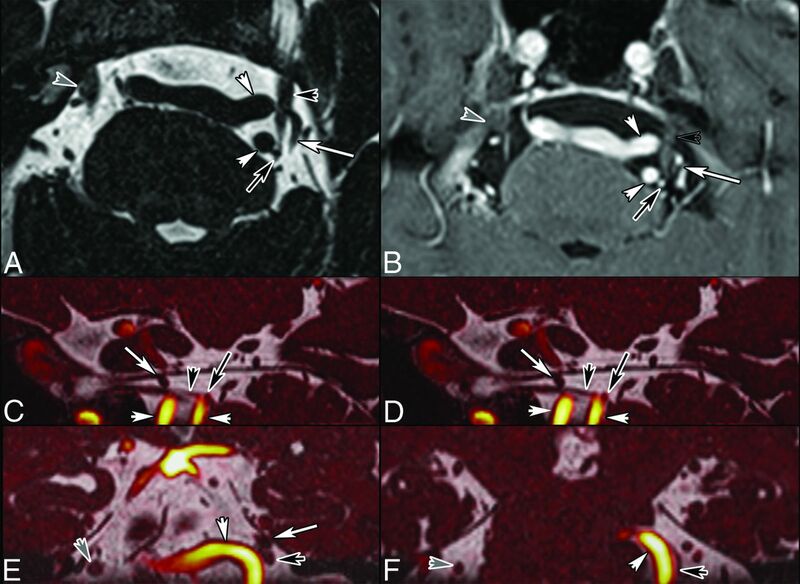 Axial T2-weighted (A), fused T2-weighted and TOF (B) images, and contrast-enhanced 3D T1 gradient recalled-echo image (C) show displacement and contact between CN IX (long arrows) and a tortuous vertebral artery (short arrows). Note that in B, 2 contact points are seen, 1 proximal and 1 more distal. Black arrows point to the contralateral IX–X nerve complex. Findings were confirmed surgically. Left invalidating GN caused by a posterior inferior cerebellar artery (PICA) loop in an 80-year-old otherwise healthy female patient. 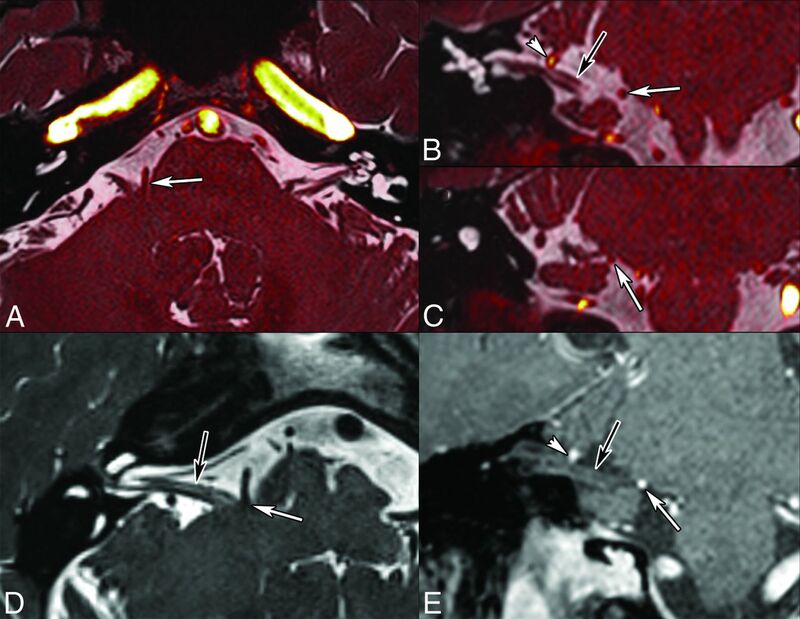 Fusion of 3D T2 and TOF angiography sequences (A, axial; B, coronal oblique) reveals displacement of CN IX (white arrows) and contact between the TZ of CN IX and the left PICA (arrowheads). Right CN IX is indicated by a black arrowhead. TZ length and location vary between cranial nerves (Fig 12). While the TZ is close to the brain stem and overlaps the REZ in CN V, VII, and IX, it is longer, located more distally, and does not overlap the REZ in CN VIII.9 Although symptomatic NVCS can occur outside the TZ, most NVCSs are seen at the TZ. MR imaging with high-resolution heavily T2-weighted sequences and angiography sequences plays a major role in the identification of the compressing vessel, its precise location, and ruling out other causes of pain that may mimic NVCS. DTI with tractography is a potential biomarker in TN. 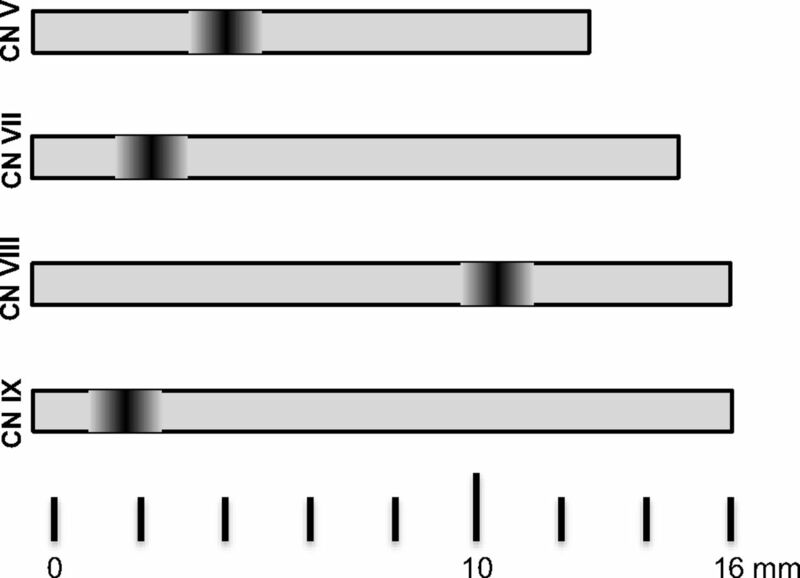 Schematic illustration of the cisternal length and location of the transition zone for CN V, VII, VIII, and IX. Disclosures: Sven Haller—UNRELATED: Grants/Grants Pending: Swiss National Science Foundation,* Comments: project on real-time fMRI neurofeedback. *Money paid to the institution.